“Geckos are being rehomed on Mana Island.” Story from Kapi-Mana News July 2015 and bits added from Wellington Scoop “23 geckos moved to Mana Island from threatened site in Belmont quarry” news from DOC. Winstone Aggregates transferred 23 ngahere geckos from an area marked for extension at Belmont Quarry to Mana Island on 5 July 2015. “From initial planning, to escorting the geckos on the boat, many people helped to ensure the geckos were transferred safely to their new home,” said Ian Wallace of Winstone Aggregates. 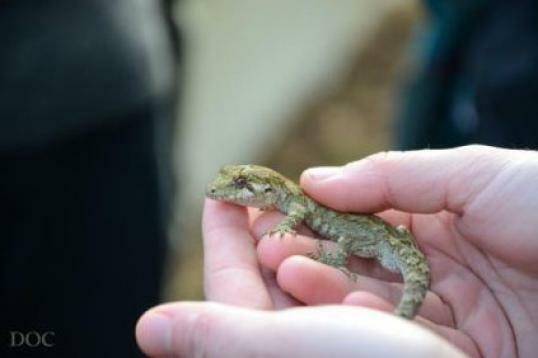 The project to rehome the geckos was a joint project involving EcoGecko Consultants, Taranaki Whanui, Ngati Toa, Friends of Mana Island, Wellington Zoo and the Department of Conservation. 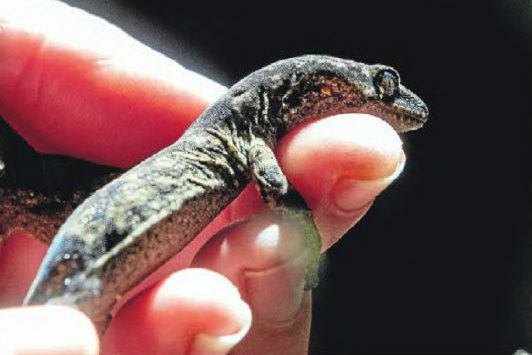 As part of extending Wellington’s Belmont Quarry, Winstone Aggregates was granted a Wildlife Authority to collect and transfer as many forest geckos as possible to Mana Island. Winstone Aggregates is also contributing to pest control and replanting in the adjoining Belmont Forest Park, and protecting lizard habitat across 10 ha of their land. During the transfer, the geckos had a quarantine”holiday” at Wellington Zoo, where they received care from the vets at The Nest Te Kōhanga. EcoGecko and Friends of Mana Island built a “soft release” fence on the island to provide a temporary enclosure for the geckos to settle in. Local iwi Taranaki Whanui supported Winstones to gift the geckos into the care of Ngati Toa on Mana Island. “Mana Island was an ideal place for Winstone to rehome the geckos,” said Department of Conservation ranger Jeff Hall. The Friends of Mana Island and Ngati Toa, with support from EcoGecko, will undertake post-release monitoring to make sure the translocation is a success. Ngahere geckos are found in older forest, but may also persist in remnant stands, scrubby vegetation and manuka and kanuka scrubland. They spend the majority of their life in the canopy so are rarely seen. You might not see Ngahere geckos in your garden, but you can help protect them by planting trees closely so the canopy connects allowing them free movement without the need to go to the ground. Encourage vines and climbers up larger trees, place bark under the climbers or tie bark onto the tree with biodegradable string. Ngahere geckos will hide in dense foliage in the canopy and these habitats can be mimicked by using hanging baskets in trees. Encouraging epiphytes to grow on trees increases diversity and food for geckos and provides extra cover. FOMI is a volunteer group formed in December 1998 to provide support for the Department of Conservation (DOC) in the restoration of Mana Island. We also work in partnership with Ngati Toa as tangata whenua. FOMI’s volunteers work on restoration projects on Mana Island, for both plants and wildlife. We also have a team of guides who run guided trips to the island for visitors. Our vision is for Mana Island to be a self-sustaining Cook Strait indigenous ecosystem, and also a place for threatened species (not just those which are native to the island).